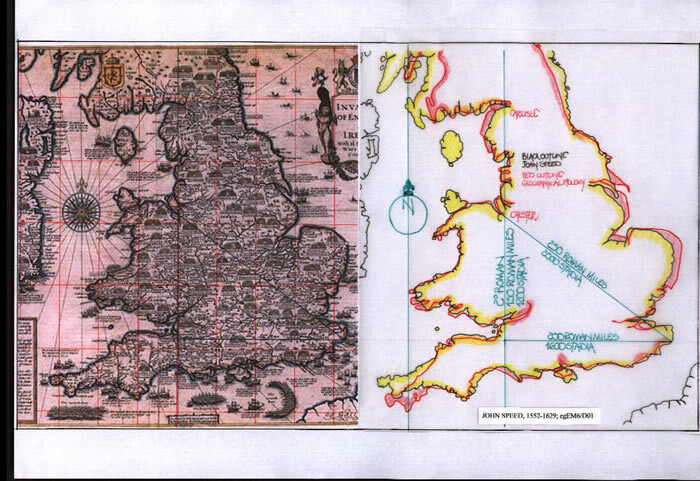 The extant English maps, that is maps generally drawn in England and Wales by cartographers normally British, have an obvious lineage as copying appears to be de rigueur. Some had bordure scales and even scale bars, others were devoid of both. But in using a geographical phenomenon, the Chester Triangle of Roman Surveyors, it is possible to compare these maps and assess how they were constructed, and show that in general the bordure scales are not representative of the drawn map, but a theoretical construct. Each map is described by a short essay, with comparative essays as necessary. Some maps have already been thoroughly examined and full length papers written on this website. They are cross-referred and each essay is individually numbered for ease of reference. “This anonymous manuscript map is the earliest surviving non-Ptolemaic map of the British Isles from the 16th century”. 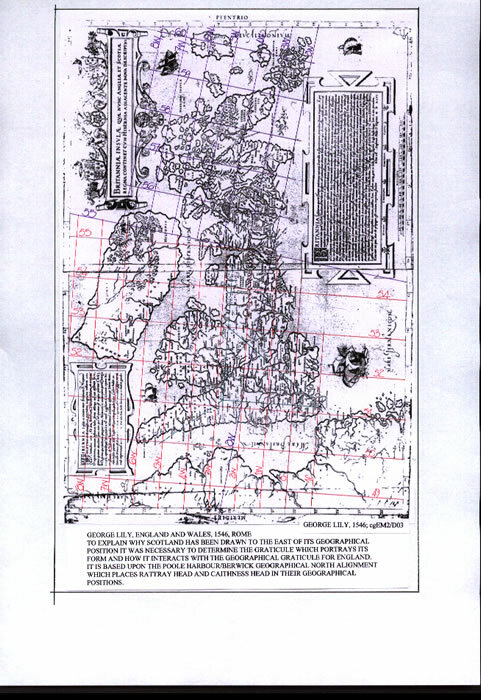 (English Maps A History pp 62/63) Diagrams cgEM1/D01 and cgEM1/D02. However, it is obvious from its form that it owes a great deal to earlier maps, notably, The Gough Map for the shape of Wales and the map of Claudius Ptolemy for the shape of East Anglia. Scotland is similar to its geographical form but grossly exaggerated in size and possibly a crib of Ptolemy’s Scotland. 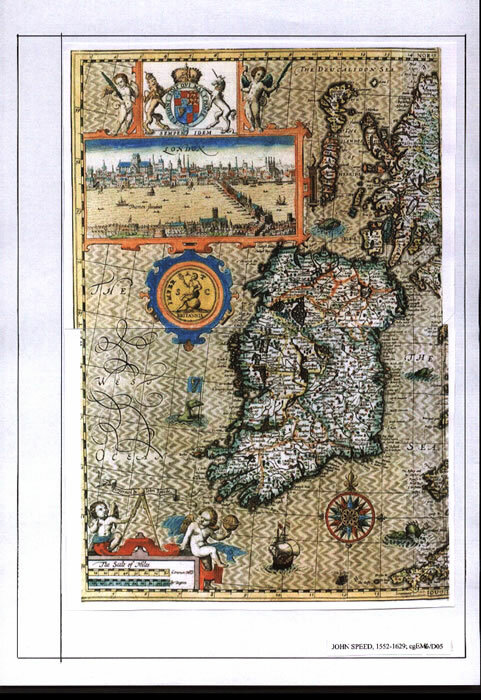 Hibernia is the subject of a separate text. The bordure scale is given in Miliaria, with the compasses open to 87.5 miliaria. Note; Scotland’s length could be either 400mp or 300mp, the text is not explicit. But, that opens the possibility of the maps author knowing that Pliny the Elder, Gildas Sapiens, Venerable Bede and Nennius all quoted Marcus Vipsanius Agrippa in that Britannia was 800mp x 300mp. The distances mentioned are shown on diagram cgEM1/D02; they are milia passuum or Roman Miles. But this is at variance to the maps bordure scale where they are named as Miliaria. That implies perhaps differing measurements of 5000 pedes, 1.15 or 1.2 miles (Roman or English). That is general expansions of 115% and 120% from normal lengths. The bordure scale extends from 8E to 22E, which corrects the alteration made by a scribe to the southern bordure figures that had faded, where, in refiguring the map the numbers are mis-written one degree to the east. The latitude scale is from 50N to 62N and from the appended scale bar those degrees are 62.5 Miliaria each. That of course signifies that the actual measurement of the map is probably the Roman Mile or milia passuum, as the degree would then be 62.5 x 8 stadia or 500 stadia per degree, the Ptolemaic measurement. The Roman latitudinal degree is 75mp and thus there is the 120% expansion from 62.5m. This confusion of measurements, the root cause of much bordure mis-labelling is in fact unnecessary, particularly as this author has stated the lengths in milia passuum. The map is drawn with a south coast basically aligned to the 51N latitude instead of commencing with the Cornish peninsula, Lands End, at 50N. However, the north Norfolk coastline is set at a correct 53N and the Solway Firth/Tynemouth alignment is correct at 55N. Thus there is a basic geographical form to this section of the map. As Scotland is obviously wrongly sized it is dealt with separately. To ascertain the internal geography of the southern portion of the Angliae Figura Map, as diagram cgEM1/D03 illustrates, the basic Roman survey lines noted within text cg/EM/Gn/1, and the Chester Triangle were drawn on the map; also drawn was the true north alignment of Poole Harbour to Berwick on Tweed. Thus the actual graticule was established and its alignment confirmed. Appended to this diagram is an overlay at the same scale of Ptolemaic Scotland but only for information purposes at this stage. 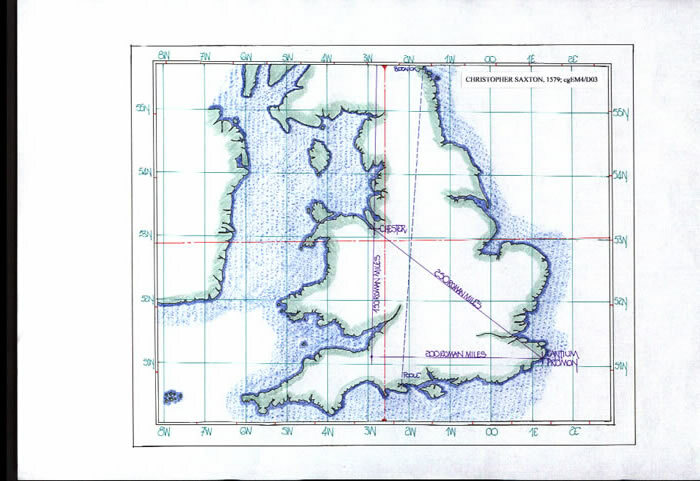 Having established the graticule and its orientation from the Chester Triangle, it was extended across the map of both England/Wales and Hibernia, as diagram cgEM1/D04 illustrates. From this information we can establish just how the map was constructed. From 50N to 55N a single graticule was used based upon the 62.5 Miliaria or 120% x Roman Miles, with a longitudinal measurement of c40 Miliaria, which is a 25:16 ratio (75:48mp). But at 55N there is an obvious change in the map, a rotation to the west for Scotland. But this is precisely the point where Claudius Ptolemy chose to rotate his Scotland to the east. Thus this maps author has had to introduce a single latitudinal degree of 90 Miliaria (144%) to enable the 56N latitude on our reconstructed graticule to align at the Firth of Forth. Rotate Scotland back eastwards and the 56N could be aligned properly. But why introduce a 90 miliaria measurement? The answer is again the confused measures and mathematics of the age; 75mp x 120% = 90mp and thus our author has confused the two measures. This point is again evidenced in the next section on Scotland. But, this indicates the bordure graticule being drawn after the map and not contiguous with it or used for its construction. The Miliaria scale is however quite pertinent to the map! 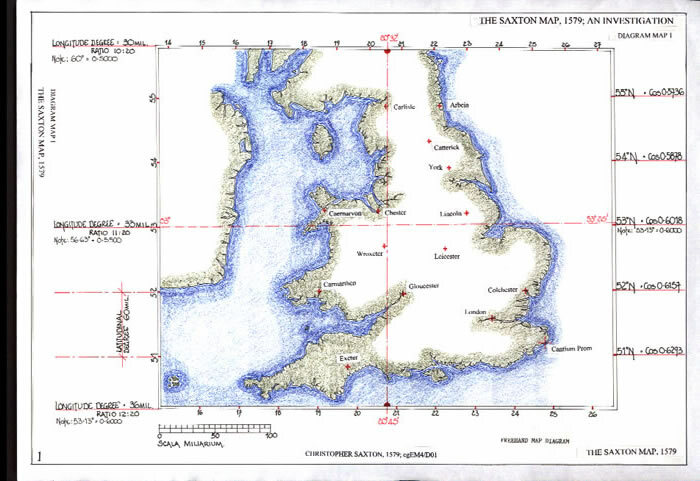 The map clearly illustrates that the overall length of the Island is in two sections; England and Wales, 51N to 55N with Berwick at 56N; Scotland from 55N to 61N. Even allowing the two to be 51N to 56N and 56N to 61N, the gross enlargement of Scotland is not geographical. But of course we are aware of its length; “Scotland takes up an equal length, (to St Buryan/Berwick at 400mp or the Dover/Berwick 300mp), but is greatly inferior in width”. Does the map indicate the 400mp measurement over the 300mp, by this devise? Thus we can re-assess the Latitudes of Scotland, but, whence came the basic shape as drawn? An overlay to diagram cgEM1/D03, Scotland from 56N, illustrates how the Scotland of Ptolemy can be shown to be the basis for the latitudinal enlargement. A green line noted as “correct alignments” has been drawn across the map from Berwick to Arran, passing through the correct towns etc. However, a correct alignment across the Firth of Forth to Clyde Estuary is at a totally different angle, tilted west. From the Ptolemaic Map of Britannia the alignment can be used to superimpose the same scale map with the Ptolemaic graticule there-on. From this it is possible to determine the latitudes of the map for Scotland. They are in fact 105 Miliaria as diagram cgEM1/D04 illustrates. Thus to draw the map its author has had to expand the latitudes from 62.5 to 90 to 105 Miliaria as the various maps were blended to form the Angliae Figura. However, the maps author has cleverly indicated the reasoning behind the choice of the varying latitudes as follows; 62.5 x 120% = 75 and 75 x 120% = 90 and the next measurement is 105 miliaria. That is a series of ratios from 5:6, 5:6 and 6:7. But the compasses on the scale bar are extended to 87.5 miliaria with the largest measure being 105 miliaria and therefore not on the scale bar. So what has our author signalled, that 87.5 x 120% = 105 miliaria. The latitudinal scales are a deliberate mathematical progression. However, this is not the complete picture; the longitudes must be attributed to the geographic system of the English part of the map. Thus diagram cgEM1/D05 has there-on an overlay for Scotland of the Ptolemaic map to the Angliae Figura with the naturally occurring coincident graticules, such that the Berwick longitude is no longer 2W but becomes 3W, because of the twisted map form. 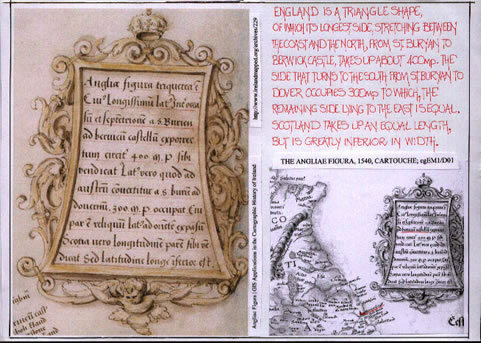 It was clearly shown in text CP1 that there was no pivot point in the Ptolemaic map of Britannia, it was a geometric construct from a triangle having sides 3:4:5 based upon the geographic Novantorum Peninsula moving east and north. 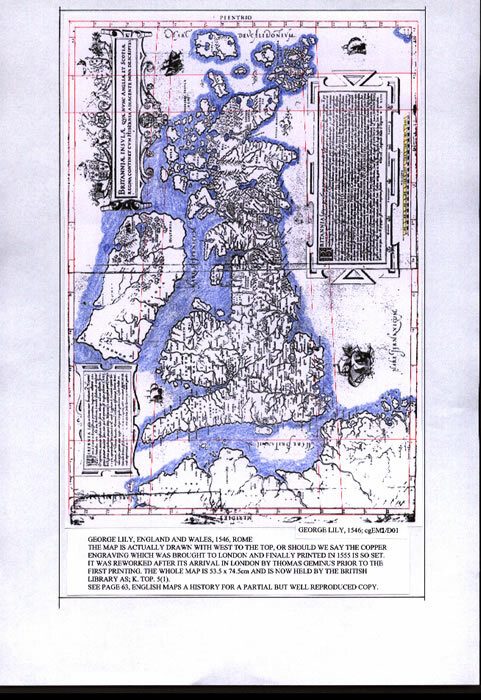 Therefore as diagram cgEM1/D06 illustrates with a full overlay of the Geographical Ptolemaic map, the Angliae Figura may appear accurate, but the distortions are so evident. There was no Roman Survey of Scotland equivalent to the English section that can be used to establish the maps veracity. Claudius Ptolemy drew a reasonable map of Scotland, but being fixated upon the 500 stadia latitudinal measure could not accommodate Scotland in its proper position north of England and turned it to the east. Thus when later cartographers grappled with that map, they realised it must be re-orientated but turned it too far west. The information gained by Ptolemy can only have come from Roman Sources, a Roman base map, such as one by Marcus Vipsanius Agrippa, augmented by Claudian surveyors who circumnavigated Britannia. The Angliae Figura has a latitudinal measurement of 10 degrees, 625 Miliaria or 750 Roman Miles. The 500 stadia multiplied by 120% to give 600 (604) stadia geographical. From Pliny the Elder we know that Agrippa considered Britannia to be 800 x 300 Roman miles. To compare the Angliae Figura map, an overlay of the Geographical Ptolemaic Map has been drawn and aligned at Cantium Promontory as diagram cgEM1/D06 illustrates. Thus it can be seen that only two areas of the map are comparable, but that from within the 50N to 61N the comparison is 8.5 degrees geographical to 10 degrees AF, c118% expansion, which is no doubt the 120% expansion we would expect from 500 to 600 stadia. 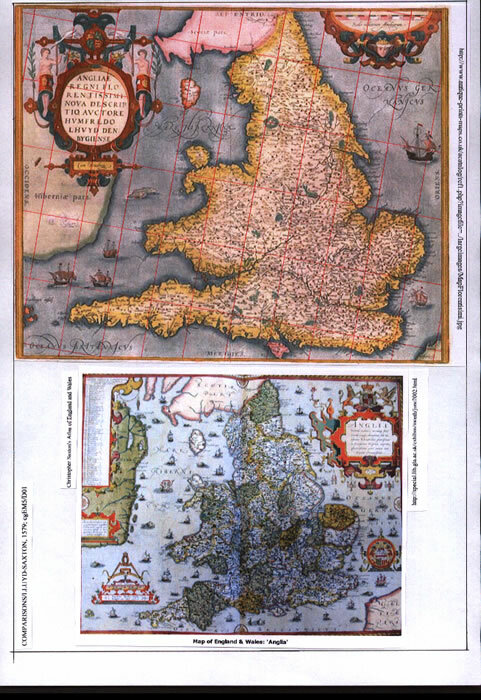 The second comparison, cgEM1/D07 is to a map of virtually the same date by George Lily, drawn in Rome, 1546. It is similar to the Angliae Figura in that it has the Welsh and East Anglian forms, but it is aligned more correctly to north. The scale bars are the same and the bordure scales can be aligned to produce a convincing comparison. In fact, if the George Lily map were to be pivoted westerly as the Angliae Figura, they could be considered to be copies of a singular parent map. Both Scotland and Hibernia would align map to map. A separate essay which follows discusses the George Lily map in detail. 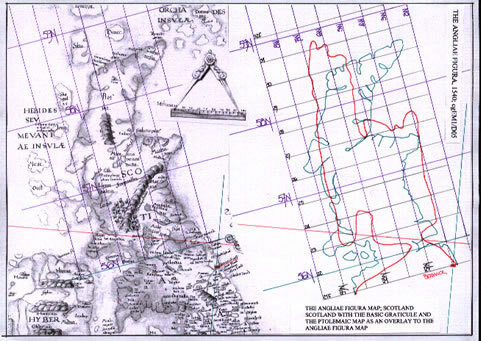 The Angliae Figura being the earliest extant map of the British Isles is the first to illustrate a tilting towards east or west of Scotland. The basic graticule of the map does not fit the map itself and is obviously the cartographers’ knowledge of the form of the Earth, the tapering longitudes being expressed within the bordure. The actual graticule indicated upon diagram cgEM1/D04 illustrates the problem of true north for these early cartographers and is possibly the result of the use of magnetic north to align the map. This though is pure conjecture as other maps vary the position of true north considerably more than the 5 degree twist here-on. The map is a plain flat-earth map. The map is an amalgam of several maps and as shown by the George Lily map drawn in Rome, there could have been a parent map which was available and this could have been a Roman Map used by Claudius Ptolemy. This map of the British Isles, as diagram cgEM2/D01 illustrates is a fair geographical representation of the islands. Its format for Britannia ranges from 14.5E to 23.5E and from 51N to 60.5N. The bordure scale is 60 miliaria per degree of latitude. 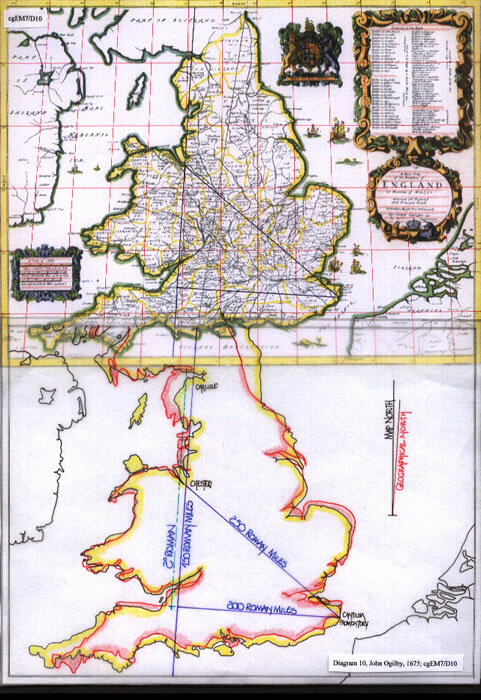 As with the preceding map, the Angliae Figura, it has Wales drawn in a similar manner to the Gough Map and East Anglia squeezed by one degree of longitude as per the Ptolemaic map. The map is also twisted to the east against the rectangular bordure when a geographical north is aligned across the map. It is as though the latitudinal marks on the east and west should be numbered with the western side gaining one degree such that 50N becomes 51N; this would then provide for a reasonable geographic alignment. This fact has been illustrated by diagram cgEM2/D02, where-on the Chester triangle has been used to locate NSEW and provide a measurement check for the latitudinal scale. A graticule based upon this new alignment has been appended to the map with geographical notation. It shows that the overall scale is nearly perfect; Lands End when placed at 50N, to the Kent Coast at 51N/1E, then the North Norfolk Coast at 53N and the Solway/Tynemouth line is 55N. There is then a minor aberration in the map with Scotland being set with its most northerly point at 59N; that is half a degree north of its geographical position. The longitudinal measure is equally acceptable in that from the Kent Coast 51N/1E to Lands End, the expansion is only a half degree; that is, it is shown as 6W instead of 5.5W. But, the imposed grid aligned to the Chester triangle is not a geographically aligned north as diagram cgEM2/D03 indicates. 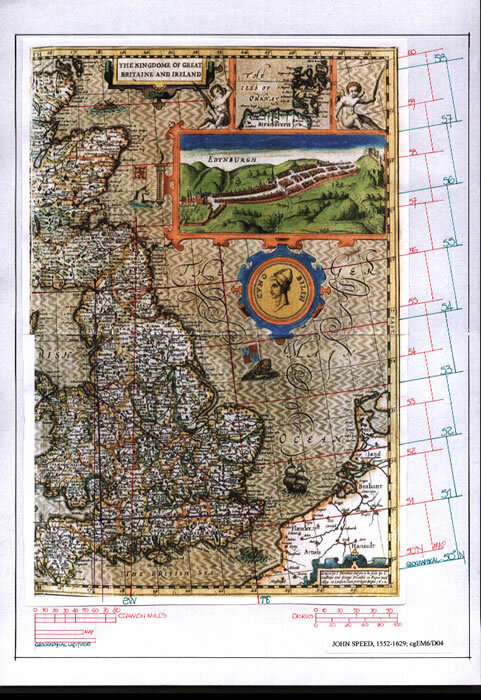 If the alignment from Poole Harbour to Berwick, the 2W longitude is drawn there-on it is at variance to the graticule, but it does provide for the natural alignment of Scotland, the northern portion of the map. 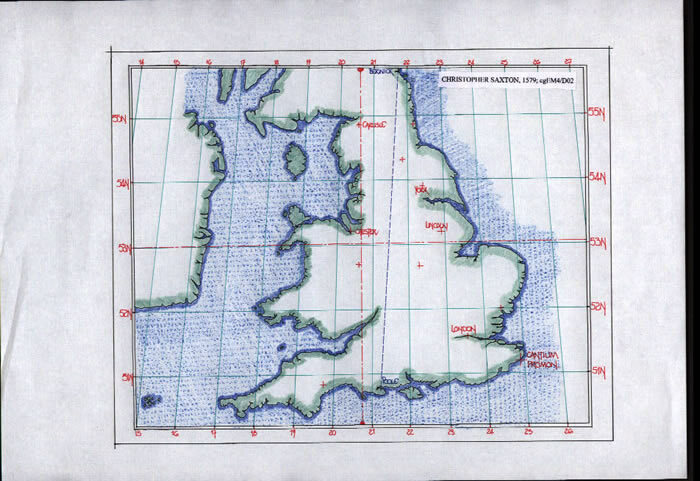 By pivoting the 55N latitude at Tynemouth, the “supposed pivot point” for the turning of Scotland on the Ptolemaic Map of Britannia, the graticule can be extended across Scotland and thus can be seen to produce a more apt conformity to a geographical co-ordinate grid. 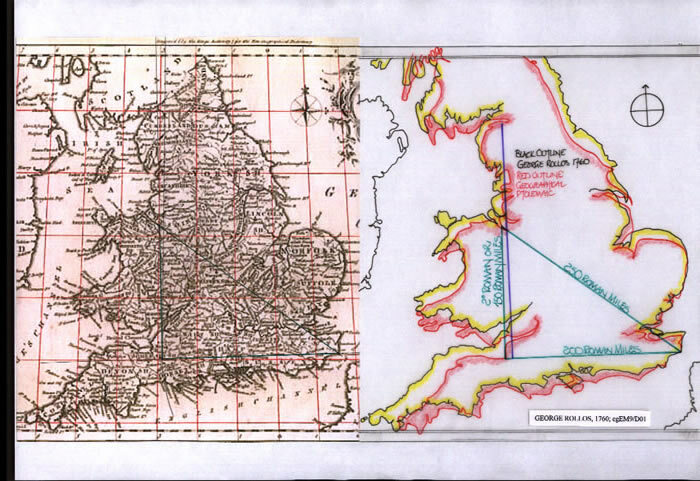 It was necessary therefore to align a Geographical Ptolemaic map of Britannia to the George Lily map, as diagram cgEM2/D04 illustrates, with an overlay of the former on the latter. Aligned at Cantium Promontory, the difference in latitudes is minimal, but the positioning of Northern England and Scotland to the east no doubt arises from the Ptolemaic Map of 150AD and the necessity to re-align Scotland. Finally the last diagram, cgEM2/D05 has an outline of the George Lily map set upon the Angliae Figura map with the 51N and 55N latitudes aligned and two longitudes appended to illustrate just how accurately the two tapering graticules align when the latitudes are of equal size. There is however one last problem to resolve, that of the base longitude for the maps bordure scale. This map has the south coast extending from 15E to 23.5E, with London at 22E. The base longitudes used in antiquity are; Fortunate Isles 15-17W; Azores, 25W and the Cape Verde Isles 25/26W. It is therefore probable that the Fortunate Isles were chosen which is as per the Ptolemaic methodology. Thus the map has been moved 2 degrees east from the Ptolemaic base of Cantium Promontory at 22E and London 20E. The map by George Lily has an erect Britannia which somewhat corrects the slope of the Angliae Figura map, but, it has been moved to far eastwards. The map is twisted eastwards and is perhaps drawn from the same base map as the Angliae Figura. The English latitudes from 50N to 55N are quite accurate, with the North Norfolk coast correctly positioned at 53N. Scotland is drawn to the same graticule scale, although tilted eastwards. Somewhere in antiquity an accurate map of Britannia existed. If it was a Roman Map, then Rome may have been a satisfactory repository for a copy and thus it was available to George Lily in 1546. That also implies a copy was available in England at the same time. Thus we have the Gough Map thought to be from a Roman original; the Angliae Figura and the George Lily maps both copy the Gough Map for the shape of Wales and copy Ptolemy for the size of East Anglia, but why did they not copy Ptolemy for the Welsh landscape which although not perfect has a closer geographical form. The Romans knew the shape of Wales, thus it is not from Ptolemy or them. There is therefore a basic map of Wales with Cardigan Bay, the Mabinogion lost land, shown there-on. It ignores the Lleyn Peninsula and the Island of Saints, Bardsey Island, which was well known in the 7th century; it ignores the St David’s Peninsula and increases the landmass significantly. This may have been done for political purposes, but even Matthew Paris ignored both. The George Lily map is however a remarkable map for the age. Although drawn by Humphrey Lluyd it was not published in Britannia but sent to Europe; Abraham Ortelius, in 1579 published the map and then included it in his later “Theatrum Orbis Terrarum”. 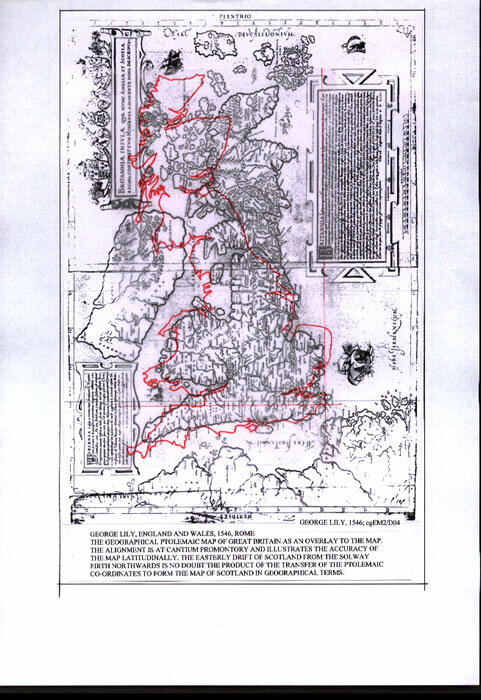 The map has been subjected to the same examination as previous maps in that a Chester Triangle was appended to establish a basic scale of Latitude and NSEW. There is no bordure scale but the map north is set c10 degrees from geographical north as the diagram cgEM3/D01 illustrates. 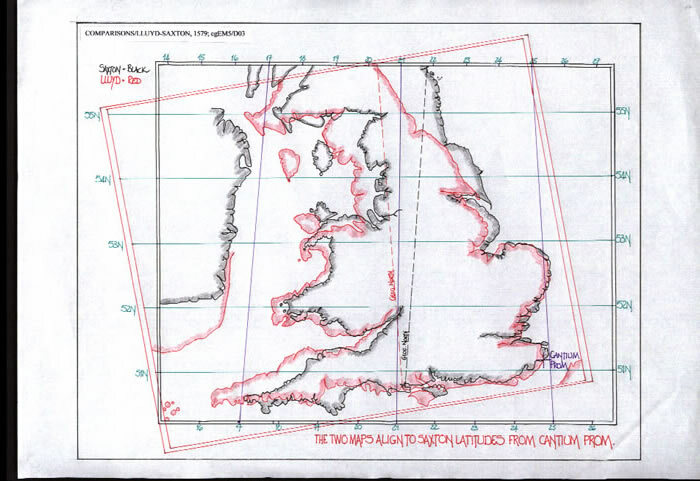 The graticule appended is a geographical latitudinal grid based upon three known points; Kent Coast 51N/1E; N Norfolk, 53N and Solway/Tynemouth, 55N. These are correct to the latitudinal distance given by the 2 degrees of the Chester Triangle; however, the longitudinal spread of the south-coast is 8 degrees when geographically it is 6.5 degrees. As the map form approaches 55N the landmass is twisted to the west by one degree longitude on the graticule. Thus the majority of a due north, Poole Harbour to Berwick longitudinal line is correct with only the last degree of latitude; i.e. 54N to 55N twisting to the west. The longitudinal grid is 115% greater than a standard 20:11 graticule based upon 75 Roman Miles. That is an expansion of 41.25 RM or 330 stadia to 47.4 RM or 380 stadia. This is precisely the longitudinal expansion that Joan Blaeu applied to the map of Christopher Saxton, whilst maintaining the latitudinal scale. The Saxton Map is also dated to 1579. It is perhaps pertinent to point out that both the Lluyd and Saxton maps are noted as “Florentissimi” in their cartouche. Does this mean that both maps have the same original as their base map? Copying was rather de rigueur. 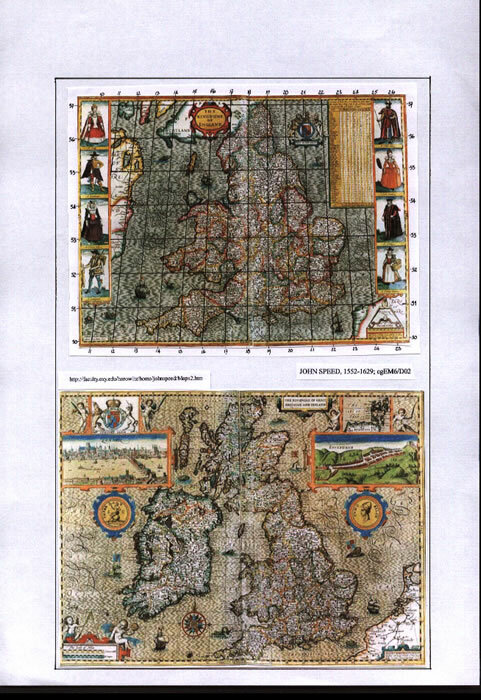 The question to be posited, but probably not answered, is; “Why did Abraham Ortelius and Joan Blaeu expand the longitudinal measurements of these English maps”? 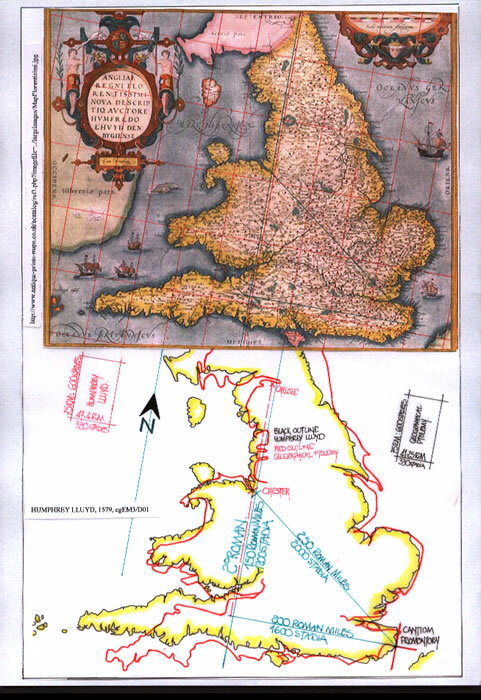 The map cgEM4/D01 depicts both England and Wales and is one of 35 coloured maps forming an Elizabethan era landmark publishing feat; a complete set of maps. The original printing of the map was without bordure scales, with only the centre line longitude and latitude marker cartouche for reference. From these it may not have been appreciated there was a tilt to the map, but once the actual latitude and longitude markers, cgEM4/D02) were set on the bordure it should have been obvious there was a tilt of the original map graticule to the west. But we must be cautious; anything added after the original engraving could well have been inaccurate. A full text reference Cs1 is on this website. The Chester Triangle has been used to align NSEW, (cgEM4/D03), and also to provide the latitudinal scale from its north/south side of 2 degrees latitude or 150 Roman Miles. The Miliaria scale of the map is very close to the Chester Triangle latitudinal scale and perhaps the difference should be ignored. But the diagram as with all others has been drawn as accurately as possible and the minor inaccuracy therefore shows with the latitudinal alignments. The rectangular graticule is therefore an 8:5 ratio i.e. 20:12.5 (not 20:11), with it indicating Lands End slightly out of position; it is ½ degree west and ½ degree north of its geographical position. The graticule, other than the small error noted is very accurate when compared to the geographical graticule. But the most northern portion from 54.5N, to the Scottish border at Berwick is oversized, such that Berwick is not due north of Poole harbour, but to the east as the diagram illustrates (cgEM4/D03). Thus the general area of England and Wales south of the 54N latitude is very accurate by comparison, but that does not mean it is longitudinally accurate, it is not (see text Cs1). The final diagram, cgEM4/D04, illustrates how Joan Blaeu took the Saxton map and used it perfectly well in its latitudinal scale but increased the longitudinal scale by 115%. This problem is encountered time and again with continental map-makers and the scales. Abstract; From measurements of the graticules on Saxton’s two general maps of England and Wales, the Atlas map of Anglia and the Wall map of Britannia together with other evidence it is argued that neither map was drawn according to any specific projection, but that both were effectively produced as Flat Earth maps with the graticules superimposed afterwards”. Thus, the problem of relying on the graticule of these maps for their form is one fraught with difficulty and should in fact not be considered. In all probability it is quite correct to opine that all of these maps are Flat Earth. 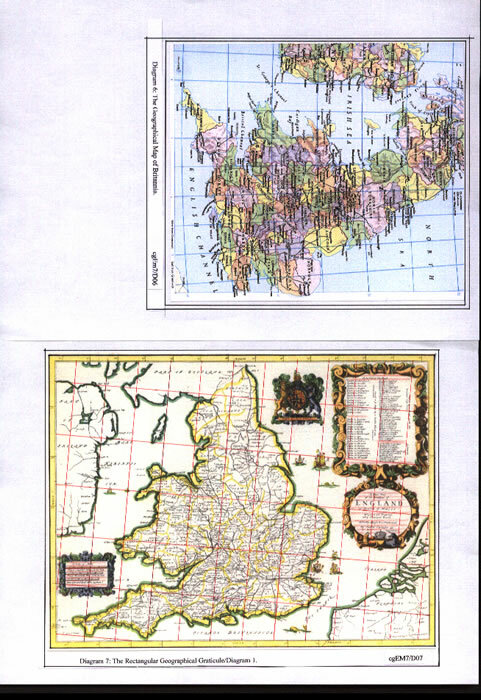 Both maps, cgEM5/D01, are dated to 1579, and cover the same geographical area of England and Wales. However, when the two are aligned by latitude and longitudinally based upon Cantium Promontory, the maps are comparable. That is, Eastern England aligns as well as Wales, but Cornwall and England north of 53N drift apart. The overlay of the two maps indicates the latitudes utilized are the same, but, the longitudes vary. The Saxton map has tapering graticules. But, as the Lluyd map was drawn, or at least presented without graticules, they have been interpolated to represent a geographical grid. But, this is on a map which is obviously expanded longitudinally therefore they are geographical for the map but not for reality. The longitudes vary such that the bordures are totally askew, but, they are probably drawn from a single base map. The diagram cgEM5/D02 has the longitudinal lines for three positions to illustrate not only the precision of the overlay but the difference between the tapered and rectangular graticules. But when, as diagram cgEM5/D03 illustrates, the two maps are aligned by the 51N/1E, Kent Coast geographical position, the coastlines vary considerably, and it can be seen that the Lluyd map is an expanded England and Wales when the coastline of East Anglia aligns on both maps, and as we move west the map expands. We therefore read the eastern coast at c1.5E, but the west coast expands by between ½ and 1 degree. This is a 115% expansion and is perhaps the resultant of a European cartographers re-drafting of the map. When a comparison is made between the Saxton Map and that of Joan Blaeu, there is a 115% expansion, a completely un-necessary expansion of the Saxton map by Blaeu, but this is the same expansion as Abraham Ortelius indicates on the Lluyd map. John Speed, 1552-1629, was a member of the Society of Antiquaries, an historian and a cartographer/engraver. He was possibly the most well known cartographer of the Stuart period in England. He published his, “Historie of Great Britaine” in 1611 but acknowledged for his maps he used the works of both Christopher Saxton and John Norden. His Atlas, “The Theatre of the Empire of Great Britaine” was published in 1610/1612 and contained the first set of individual county maps of England and Wales as well as maps of Ireland and a general map of Scotland. There are three maps by John Speed illustrated here-in; “The Kindome of England”; “The Kingdome of Great Britaine and Ireland” and “The Invasion of England and Ireland with all their civill wars since the conquest”. “The Kingdome of Great Britaine and Ireland” is altogether a different map as diagrams cgEM6/D01, cgEM6/D04 and cgEM6/D05 illustrate. It has curved latitudinal lines and tapering longitudes, which are yet again wrongly dimensioned. The map was engraved (as stated there-on) by Joducus Hondius in Amsterdam, but noted as “Performed by John Speede”, and thus we must expect similarities. However, those similarities extend to a complete re-use of the erroneous graticule of the previous map as diagrams cgEM6/D03 and cgEM6/D04 illustrate. The error is the same on both, in that the 51N latitude is correctly positioned but then 4 degrees geographical is divided into 5 degrees map-scale; i.e. the map-scale degrees are either 55.2 statute miles or 48 Miliaria. The scale bar upon the “Kingdome of England” map is a total length of 50 miles. The scale bar on this map is of “Common Miles” and a map degree is 48 common miles. But a geographical degree is 60 common miles. Hence we may consider them to be the Miliaria, such that 60 Miliaria equals 69 statute miles or a 115% expansion. Longitudinally the 22E on the map fairly represents the 1E geographical, with the 2W geographical forming a perpendicular to the bordure scale and thus representing the centre line of England. The Chester Triangle indicates that the map scale is correct as drawn, in that the geographical degree matches the distance measure. There is a slight mis-alignment of the 2W longitude line, no doubt the result of Berwick being placed slightly east of its true position as occurs on many ancient maps. 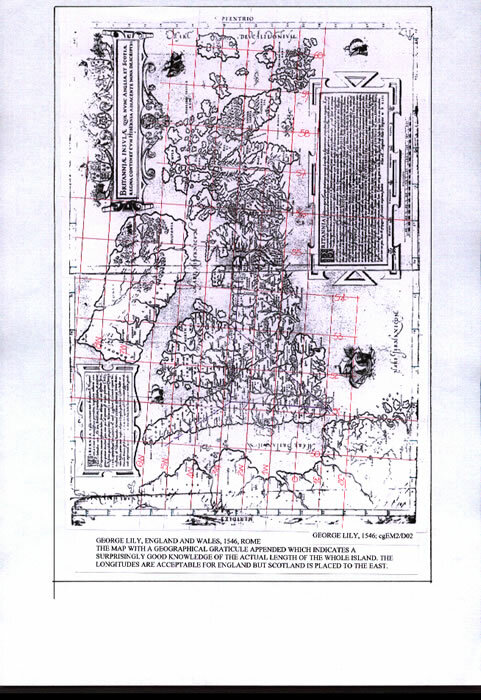 The investigation shows that the map is a plain scale rectangular graticule map, which has had false latitudinal and longitudinal lines appended. The third map is entitled “The invasion of England and Ireland with their civill wars since the conquest”; and was engraved by Cornelius Dancherts. 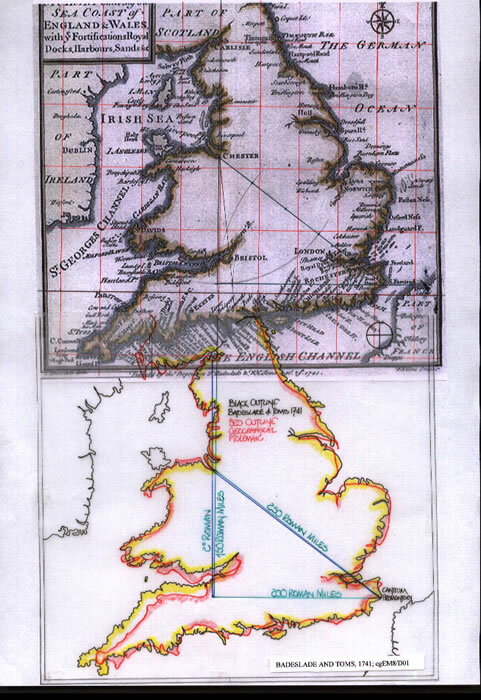 When compared to a Geographical Ptolemaic Map of Britannia aligned at Cantium Promontory, or by The Chester Triangle, it exhibits an excellent comparison and therefore the accuracy of the map. However, the graticule based upon the Chester Triangle indicates the usual expansion of longitudes with the south coast being c7.25 degrees in length instead of the geographical 6.5 degrees. That is so very close to a 115% expansion, which appears on the previous maps and probably derives from a continental mis-copy of an original British/English map because of the nebulous measurement, the Miliaria. The latitudinal scale is quite accurate as the Chester Triangle clearly illustrates and from this we may at this stage state that the latitudes of Britain had clearly been settled very accurately as far as England and Wales are concerned. That does not mean the engravers were able to place them accurately or adjust to measurements they were unfamiliar with. However, the longitudes remained a great problem, not only until John Harrison’s Watch was capable of being used across the globe measuring the time differences, but also until there was universal agreement on a fixed zero longitude. That is another tale to be told. But, the basic graticule of this map is 13:8 ratio, that is 60miliaria to 37 miliaria, and so very close to the norm of other maps. 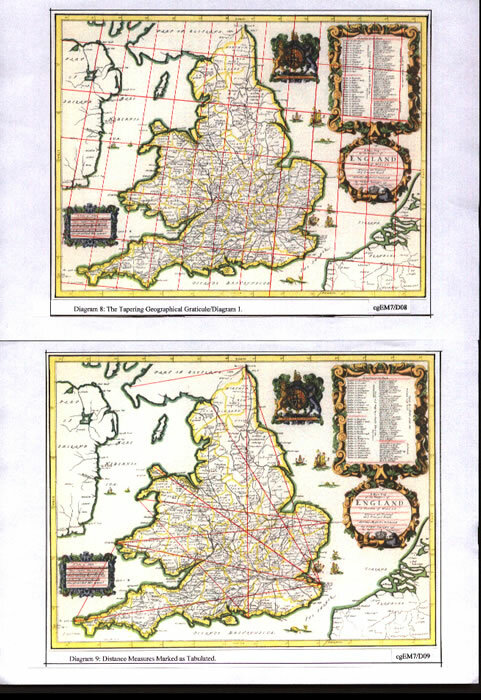 The map of England and Wales, cgEM7/D01, entitled, “A new map of the Kingdom of England and the Dominion of Wales, Where-on are projected all the principal roads actually measured and delineated”, presents us with several problems in its format. The map is drawn with the latitudes c 500 15N to 550 45N and longitudinally c200 45E to 330 15E, and is in all probability based longitudinally upon the Island of San Miguel in the Azores. At this period in map-making it was an accepted zero point, one of several to be used. However, Lands End is actually situated at 50N (it straddles the line); and if the map is studied it shows Berwick to be due north of Selsey Bill, when in fact it should be due north of Poole Harbour, which is somewhat to the west of Selsey Bill. Thus there is a basic fault with the graticule, the latitudes and longitudes of the map. It does not help to visualize the problem as they have only been marked as a bordure scale and not projected across the map. 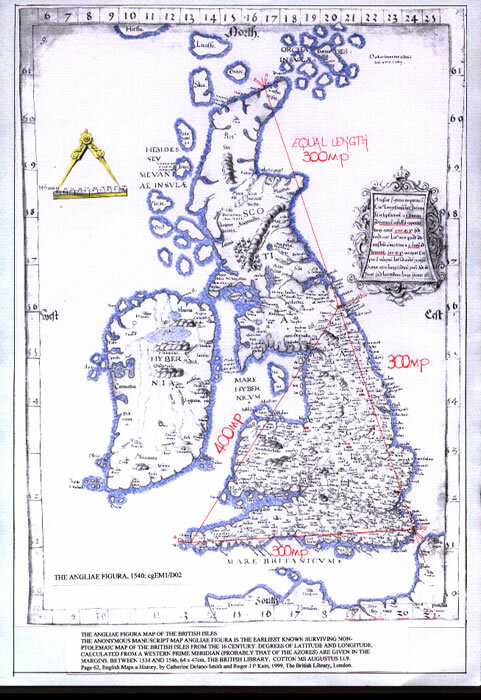 To ascertain the real accuracy of the map it is necessary to compare it with a map of Britannia drawn to Ptolemaic principles as diagram cgEM7/D01 illustrates. Firstly there-on is the John Ogilby map with its graticule drawn fully. Then the Chester Triangle which can be used to locate NSEW has been appended to show the slight error in the maps northing. But when the Poole Harbour to Berwick line is drawn the real error, the twisted northern part of England which mis-aligned Berwick becomes so very apparent. But by aligning the two Triangles we can see that the basic map is quite accurate. There are 10 diagrams to accompany this shortened text, which is actually “John Ogilby and his geographical twist”, posted as a separate text at the end of this paper as reference cgEM/JO/1. 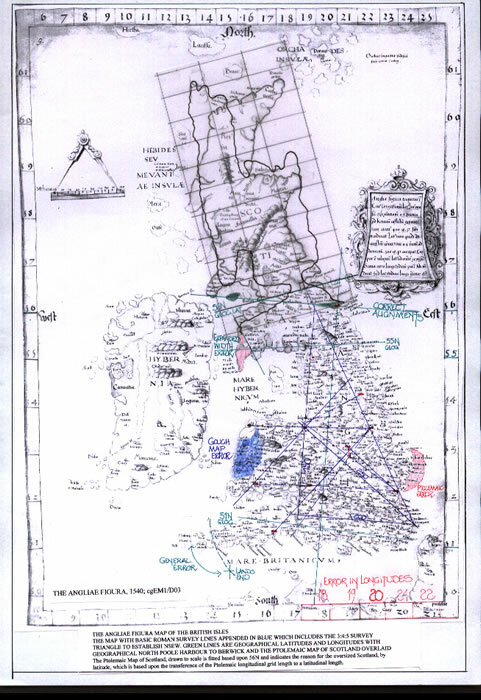 In fact it is a tribute to the surveyors who measured the roads and positioned the coastline; an excellent survey and maps as cgEM7/D02 and cgEM7/D03 illustrate. The diagrams are numbered cgEM7/D01 to cgEM7/D10, and there are two diagrams per page for D02 to D09. By 1675 the art of map-making in Britannia had evolved to provide extra-ordinarily accurate maps and developed into a major industry with such books as “Britannia” by John Ogilby. The art of surveying, the standardisation of the metrology such that the Statute Mile was used throughout the land, and the development of excellent printing facilities to illustrate what engravers were really capable of producing drove the production and marketing to, somewhat for the age, dizzy heights. The engravers art became one of the foremost in the land, be it for publication or materials such as gold and silver. But, the standardisation of “North” was still not agreed upon, nor was the basic Longitude, which had varied from map to map although a consensus had grown for one point. There are two maps by Badeslade and Toms which are investigated. 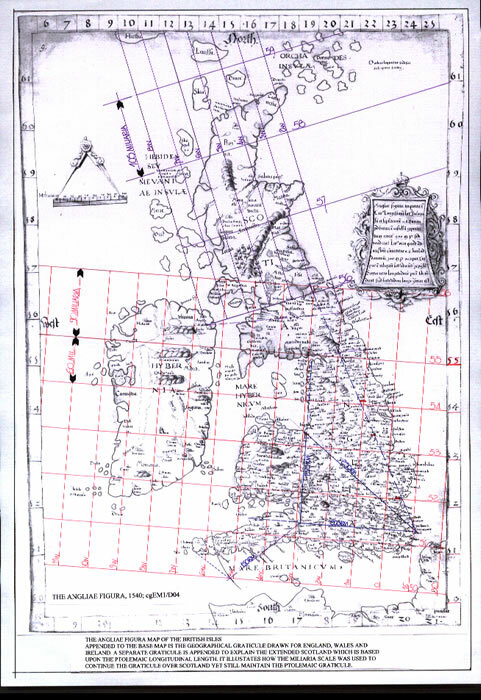 The first, cgEM8/D01, described as “a map of the sea-coast of England and Wales”, has the Chester Triangle appended to produce the NSEW of a map and the graticule latitudinal scale. There is already a north point upon the map which when compared is accurate. Latitudinally the map is very accurate, but longitudinally there is a slight expansion of the form of Britain. For comparison an overlay of the map and a Geographical Ptolemaic Map has been set out with matching Chester Triangles for reference. Thus the accuracy can be simply gauged. 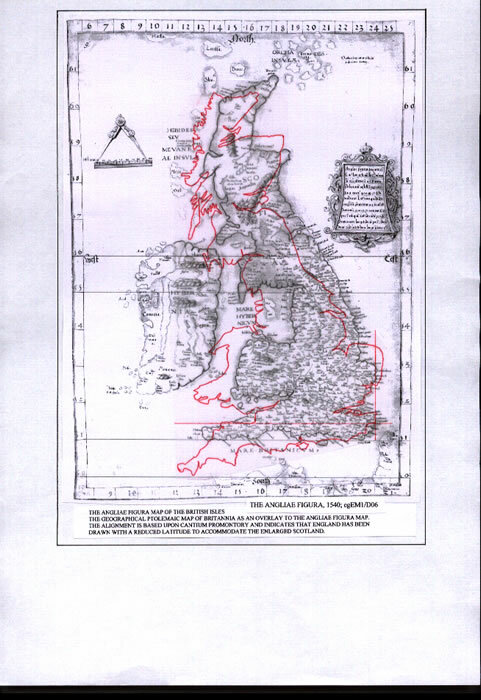 We may therefore surmise that at this period of English map production, the survey of Britain was now quite accurate and the distances to control longitude well understood. The combination of mathematics, surveying and draftsmanship now leads to real accuracy in maps. The second map, cgEM8/D02, one of two describing the Roads of Britain, is equally accurate, but the minor engraving changes, although both are engraved by the same person, W H Toms, is no doubt from the original manuscript maps. cgEM9/D01 has a tapering graticule which is not the base form of the map, but an appended form to illustrate the geographical situation of a graticule. The map has been subjected to the normal investigation by Chester Triangle and an overlay by the Geographical Ptolemaic Map. It indicates a slight expansion both latitudinally and longitudinally of the map form and a slight twist for the north point, as in fact can be seen from the maps own pointer. In 1675 John Ogilby published a book called “Britannia”, which was in fact an atlas comprising a map of England and Wales, and 100 route maps drawn in strip form. Accompanying the maps was textual advice concerning their use as a travel guide. It was thus the first British Road Atlas. But the map of Britannia, England and Wales has peculiarities in its format, one of which, such as the slightly mis-placed Cornish Peninsula is self evident, but others are somewhat hidden and therefore do not readily evidence themselves. They are investigated here-in. John Ogilby, (1600 to 1676CE) although best known for publishing the first British Road Atlas was multi-talented. In 1665 he returned to London from Ireland just in time for his house to be destroyed in the Great Fire of 1666. Following this mishap he set up a printing press in Whitefriars, publishing both Books and a series of Atlases. Thus in 1674 he gained the impressive title of “His Majesty’s Cosmographer and Geographic Printer”. 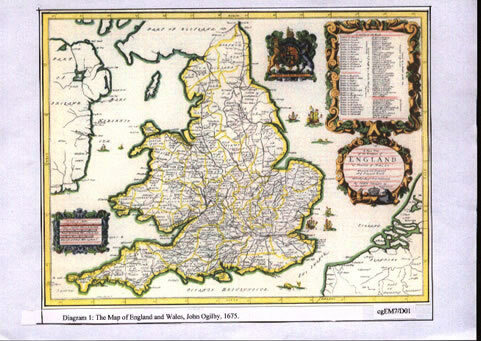 The Britannia Atlas of 1675 is considered by some the bench mark for a road atlas. It commences with a map of England and Wales with the overall routes there-on, as diagram cgEM7/D01. He used the standard mile of 8 furlongs, 1760 yards for his 100 strip maps, (as opposed to the then current Miliaria for maps), which are drawn to the scale of one inch to one mile, or 1:63360; it being marked on each map. They are a feast for the eyes and exceptionally well presented as the examples included here-in, shown by diagrams cgEM7/D02 and cgEM7/D03 clearly illustrate. But as stated, the map of England and Wales, entitled, “A new map of the Kingdom of England and the Dominion of Wales, Where-on are projected all the principal roads actually measured and delineated”, presents us with several problems in its format. The map is drawn with the latitudes c 500 15N to 550 45N and longitudinally c200 45E to 330 15E, and is in all probability based longitudinally upon the Island of San Miguel in the Azores. At this period in map-making it was an accepted zero point, one of several to be used. 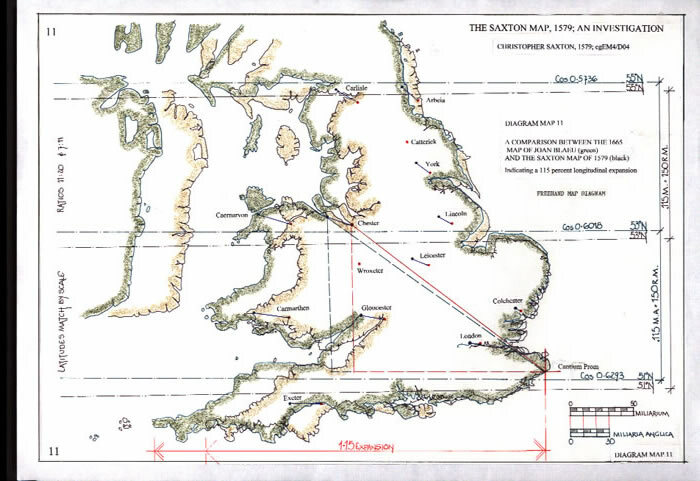 However, Lands End is actually situated at 50N (it straddles the line); and if the map is studied it shows Berwick to be due north of Selsey Bill, when in fact it should be due north of Poole Harbour, ( which is somewhat to the west of Selsey Bill). Thus there is a basic fault with the graticule, the latitudes and longitudes of the map. It does not help to visualize the problem as they have only been marked as a bordure scale and not projected across the map. If they had have been so projected I doubt this paper would be necessary as the problems would have been well noted by previous researchers and possibly the original geographer may have corrected the error. When the bordure scale is actually drawn on the map, the problem becomes so very apparent, as diagramcgEm7D04 illustrates. The whole of Britannia has been twisted easterly, no doubt pivoted from London or a point in the south-east, thus raising the Lands End Peninsula above the 50N latitude, and moving Berwick eastwards such that it wrongly aligns to the southern coastline. The complete graticule when extended across the map, at a glance looks normal. But study the latitudes and it will be found they slope to the south-west and are thus twisted. The twist is c5 degrees and possibly has its origin with the position of Magnetic North apropos Geographic North. 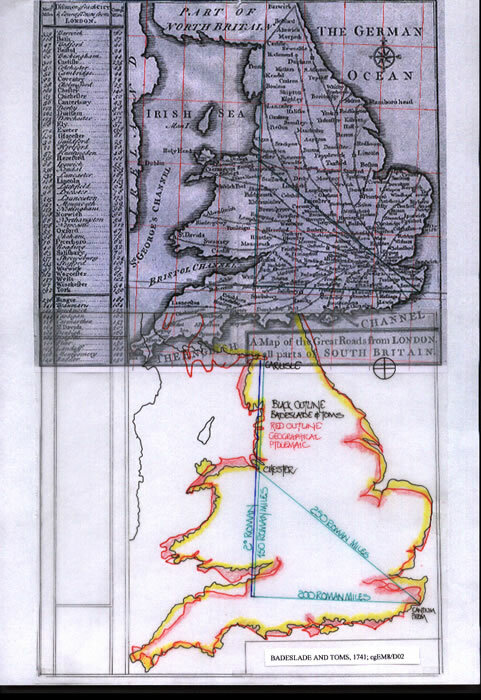 Thus by pivoting the map of Britannia eastwards, as diagram cgEm7D05 illustrates, the Magnetic North alignment supersedes the Geographic North alignment, and places the whole geographical graticule on the wrong basic alignment. The engraver would surely have carefully copied the map as presented. Therefore we must ask if this variation in the North Point is an original decision by the geographer. But using the adage as promulgated by William of Oakham, “occams’ razor” that the simplest answer is always the best for a peculiarity such as this, is it possible that the copper plate to be used for the engraving was of such a size that with a bordure area taking some space, the height of the drawn map could not be accommodated and the whole was slightly twisted to fit the area available. The bordure scale was then correctly engraved to the original map form. The geographical equivalent map for comparison with diagram cgEm7D04 is shown by diagram cgEm7D06. 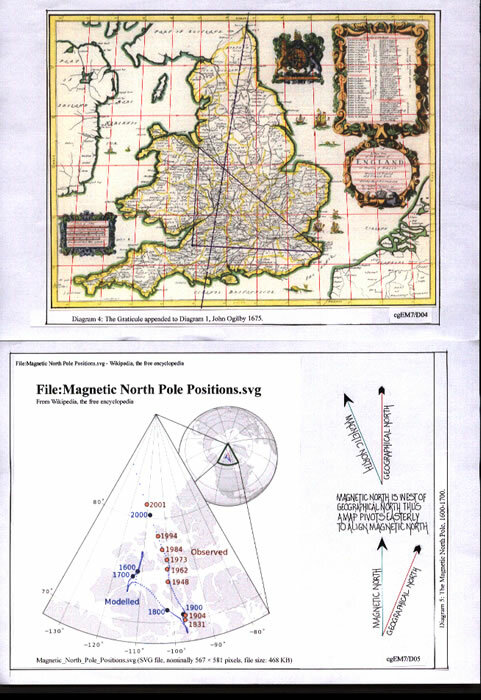 The magnetic declination or pole position from London has varied considerably over the centuries as diagram cgEm7D05 illustrated. In 1963 it was approximately 10 degrees west and today it is 5 degrees west. Thus as the diagram illustrates in 1600-1700CE, the declination reading of approximately 5 degrees variation is quite acceptable, and the map depends on the accuracy of transfer to allow for it to be drawn with a varying north. It should be noted that several maps illustrate this format and in 1560 Humphrey Lluyd had a 10 degree variation, but that map was engraved in Europe by Abraham Ortelius. It can be shown to be surprisingly accurate as a bordure scale, and at 500 15N as well as at 550 45N the ratio is correct for the geographical latitude. However, as stated it bears no relationship to the actual geographical graticule it purports to be. 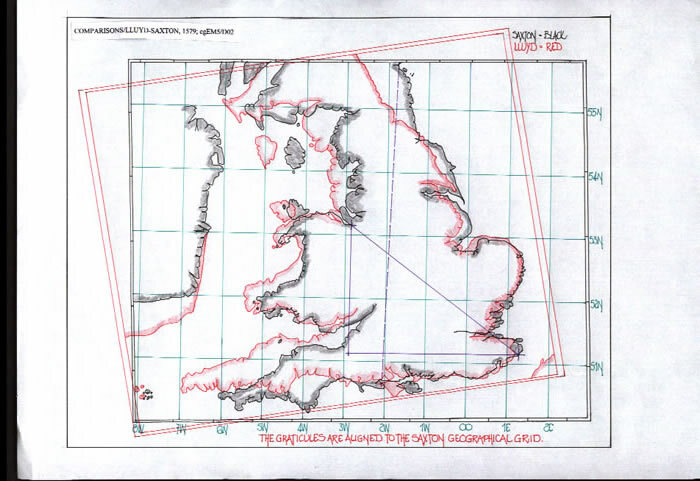 For comparison diagram cgEm7D07 has a rectangular geographical graticule drawn on the original base map. It is rectangular, with at this juncture no attempt to reduce the longitudinal distances from south to north as is geographically correct. The reason for that decision came when drafting the tapering graticule, as diagram D08 illustrates. It then became quite apparent that from that taper the basic error was amplified, but, from the rectangular graticule came a correct or more visually correct map vis a vis the graticule. The meridians on the tapering format were somewhat mis-placed and to indicate why it was necessary to calculate the inter-distances of various points on the coastline to ascertain their veracity. The measured lines are indicated upon diagram 9 for reference. St David’s Head to Lands End map 199Km actual 210Km. 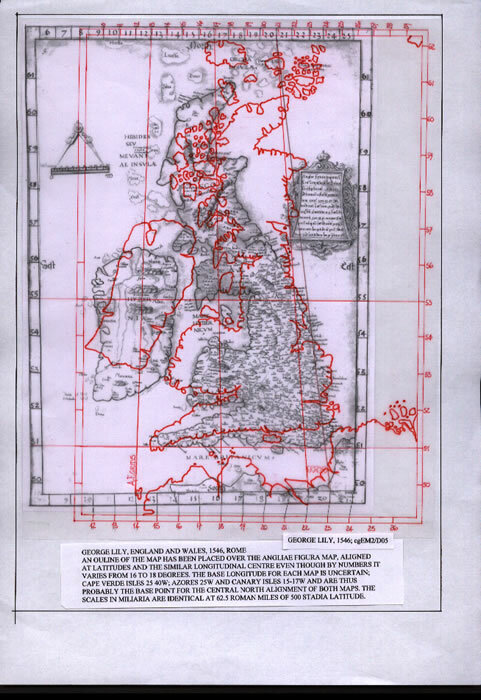 Thus it can be shown that the geographer who compiled the John Ogilby map has an excellent accuracy in his work and obviously had very accurate survey information. But, features which mar the overall accuracy such as the slightly mis-placed Cornish Peninsula, no doubt through an error in latitudinal reading and not distance measure, and the inclusion of much of Southern Scotland, the Mull of Galloway, which is not actually part of the presentation, but is positioned 50Km to far west, provides for a mis-placed Scotland above Ireland. The measurements obviously came from the roads that have been plotted and drawn on the 100 strip maps. With such a basis for the map it should be that accurate and the errors which are there, the Cornish peninsula one of regret as it is a masterpiece. To ascertain the real accuracy of the map it is necessary to compare it with a map of Britannia drawn to Ptolemaic principles as diagram cgEm7D10 illustrates. 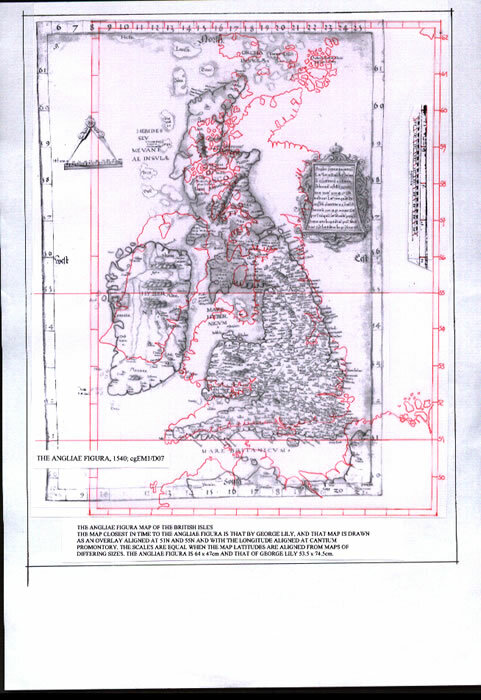 Firstly there is the John Ogilby map with its graticule drawn fully. Then the Chester Triangle which can be used to locate NSEW has been appended to show the slight error in the maps northing. But when the Poole Harbour to Berwick line is drawn the real error, the twisted northern part of England which mis-aligned Berwick becomes so very apparent. But by aligning the two Triangles we can see that the basic map is quite accurate. In fact it is a tribute to the surveyors who measured the roads and positioned the coastline; an excellent survey and map. But, the standardisation of “North” was still not agreed upon, nor was the basic Longitude, which had varied from map to map although a consensus had grown for one point. Geographical North was known and could be easily found by the simplest of methods, a gnomon or by star sights with an astrolabe. Therefore knowing full well that Latitudes and Longitudes (particularly) were determined by Geographic North, why is it possible for us to consider that Magnetic North was utilised at all? The problem, be it Magnetic North or Copper Plate Size, has led to several maps of the era being wrongly bordured by a graticule scale that does not fit the map. This website has the texts cg/EM/Gn1 and cg/Em/O which illustrate that fact. They include some 34 plus 28 maps and diagrams of English printed maps. The excellent map published by John Ogilby in 1675 is an example of this apparent blind- spot; this completely non-sensical basis for the map when the geographer would have known from latitudinal readings, and if they had fully drawn the graticule that it was in-correct. The minor displacement of Lands End by comparison pales into insignificance when compared to the deliberate mis-placement of the graticule and hence a false representation of the latitudes and longitudes. Why?———- Answers on a postcard please! 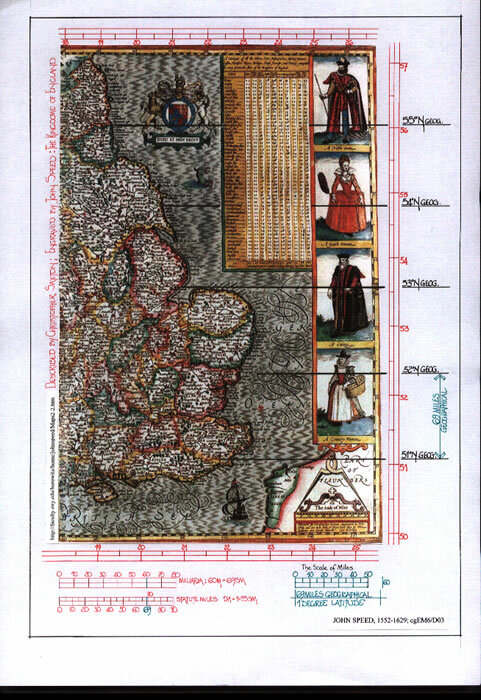 Shirley, Rodney W. “Early printed maps of the British Isles, 1477-1650”. Antique Maps, 1991. ISBN 0951491423, 9780951491423. The Holland Press Ltd, revised edition 1980. 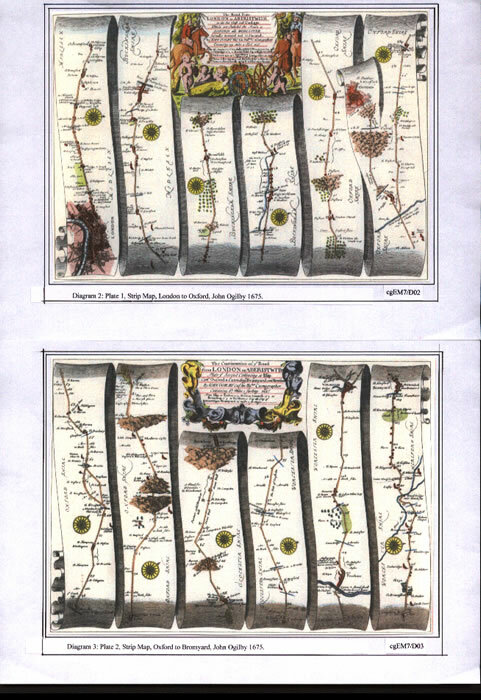 Bower David I, 2011, “Saxton’s Maps of England and Wales”, Imago Mundi, Vol 63 issue 2.